I have one issue with asparagus — it’s too tall. If I stand up the stalks in a glass with a little water, like you’re supposed to, it really only fits in the door of the refrigerator. And the door is definitely my blind spot. I glimpsed the bunch of asparagus I bought during my farmer’s market trip last Saturday as I was shutting the fridge yesterday afternoon. I guess I should take a peak in the crisper, too. Although given that the asparagus was technically in plain site, I’m a little afraid to look. Not every meal can be a home run. We grilled chicken tonight. At the last minute, I thought, Why not toss the carrots on there, too? What’s the worst that could happen? “With a squeeze of lemon,” my niece Leah added. They were edible, at least. Perhaps I didn’t grill them long enough. When I noticed they weren’t cooking as quickly as the chicken, I covered them with a lid and prayed for steam. Perhaps they didn’t need a squeeze of lemon. But I’d zested a lemon for strawberry-rhubarb muffins, and it was just lying there naked on the counter. Seemed meant to be. 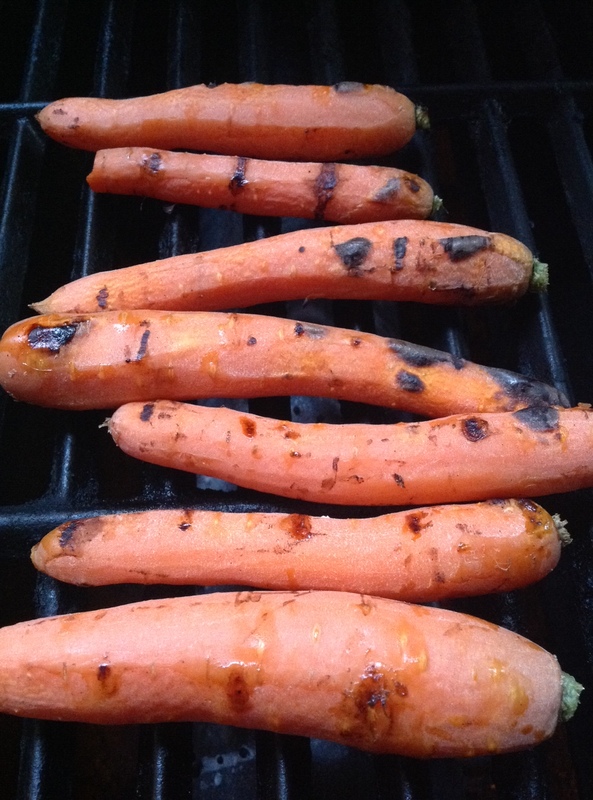 Perhaps, just perhaps, carrots aren’t meant to be grilled. 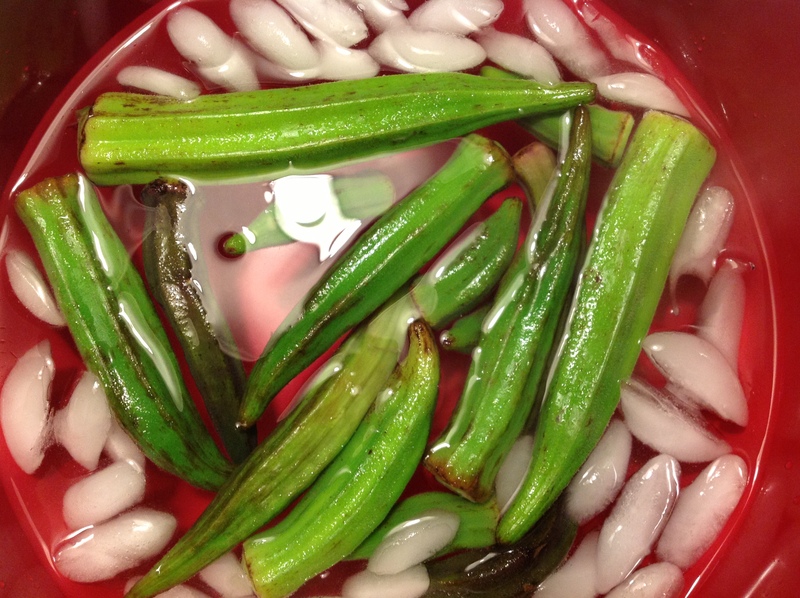 Okra in a refreshing ice bath. I couldn’t find a recipe that I loved, which was OK because I didn’t feel like going to the market twice in two days. So I used the mild Italian sausage from yesterday’s trip with the second head of cabbage from the CSA for this Fettuccine with Sausage and Cabbage recipe I found on the website for Real Simple magazine. I used rigatoni noodles instead of fettuccine because, again, I didn’t feel like going to the market; tossed in two pressed cloves of garlic because I only had two shallots; and skipped the chives, because the ones in our patio container garden died during an extended porch railing repair project a couple of weeks ago. (Yet survived last winter. Sad.) Still, the dish was delicious. Mike is finishing it off — cold and directly from the pot — as I type. Of course, the okra remained. 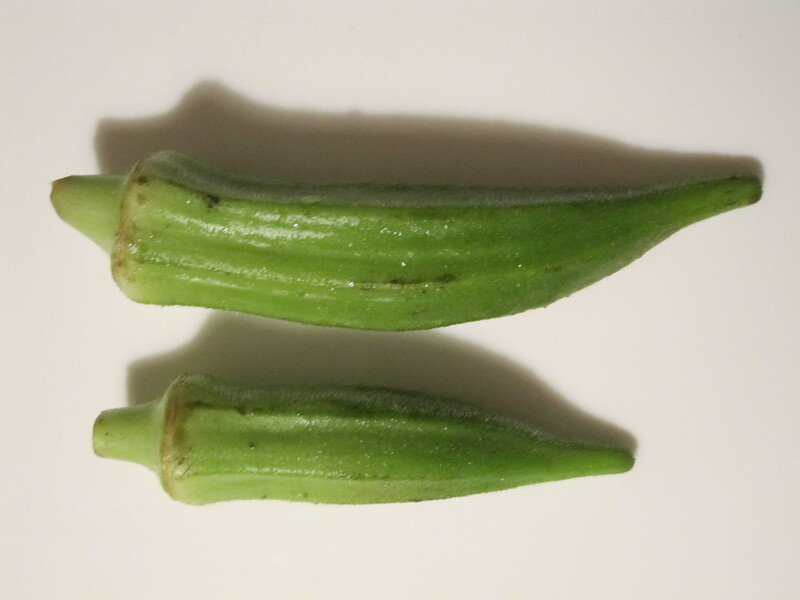 And not just the okra from this week’s share, but what was in last week’s, too. I had to face facts: I wasn’t going to use it all — er, any of it — and the okra was doomed to suffer a slow death in the crisper. 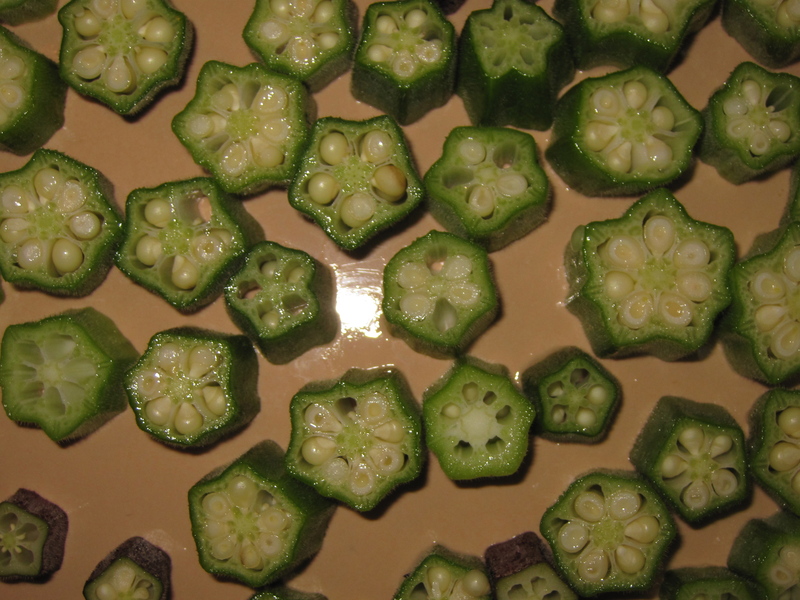 Thankfully, this English woman on YouTube, who pronounces “okra” so adorably, made freezing okra seem super simple. I sorted through the two bags, tossing out a handful that seemed sketchy, and went to work. Ms. Brit was right. Boiling okra for three minutes, immediately placing it in an ice bath for three minutes, then drying it on the counter before sticking it in a plastic bag could not have been easier. Our okra is now stashed safely in the freezer. Here’s hoping I remember to use it. Most home gardeners — and even CSA subscribers — end summer with a plethora of tomatoes. Once upon a time, when I was single and living alone in the Detroit suburbs, I planted six tomato plants in my backyard, not realizing how many tomatoes each one would produce. That’s the summer I learned how to make a tomato tart. It’s easy, it’s tasty, and it uses up a lot of tomatoes as well as basil, if you have an excess of that, too. To start, you need a crust. To simplify the process, you can buy a frozen pie crust. Or, you can whip one up. Seriously, making pie crust from scratch doesn’t take long, and if you don’t use a tart pan (shallow pie-type pan with a bottom that drops out), you can roll the dough out right onto your baking sheet. I always use my grandma’s pie crust recipe, which is also my go-to crust for apple pie. She passed away when I was in the second grade, but I don’t think she’d mind if I shared it. 2. In a bowl with a wider base, cut the shortening into the flour with a pastry blender. 3. Once the mixture has turned into little balls, add the water. Keep mixing until you’ve created a ball of dough. 4. Remove the dough ball from the bowl. At this point, you can roll it out and put it in a tart pan or, like I noted a few paragraphs ago, roll it directly onto a cookie sheet. I used a tart pan for years, but just this summer realized that I like the way the finished tart looks when it bakes on a cookie sheet. More artisan, I guess. 5. Partially bake for about 7 minutes. Yeah, that’s it. You can also use a food processor or stand mixer to make your dough. But to be honest, I find that’s a lot of cleanup for something you can accomplish in a matter of minutes with a little elbow grease, a bowl and a pastry blender. Here’s how the rest goes. 1. Reduce oven to 375 degrees. 2. 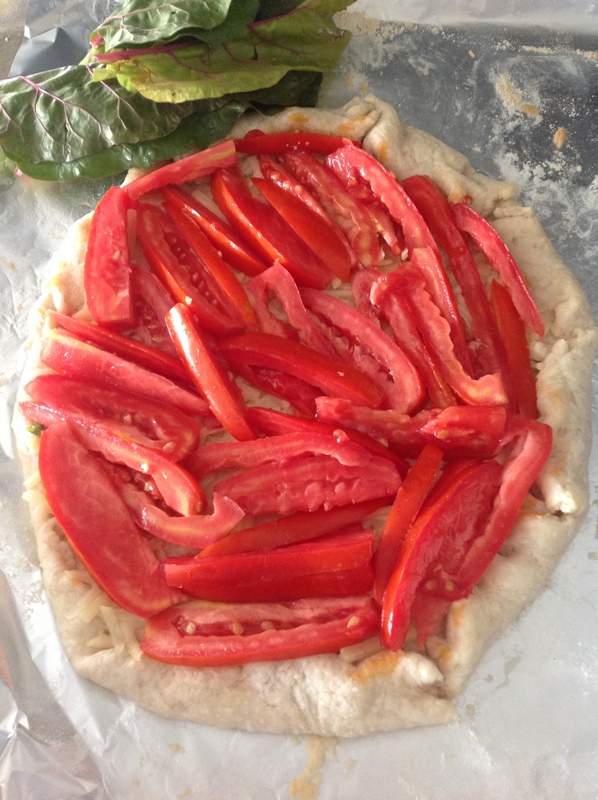 Arrange tomatoes on top of your partially baked crust. Try to fit them snugly instead of layering them. 3. 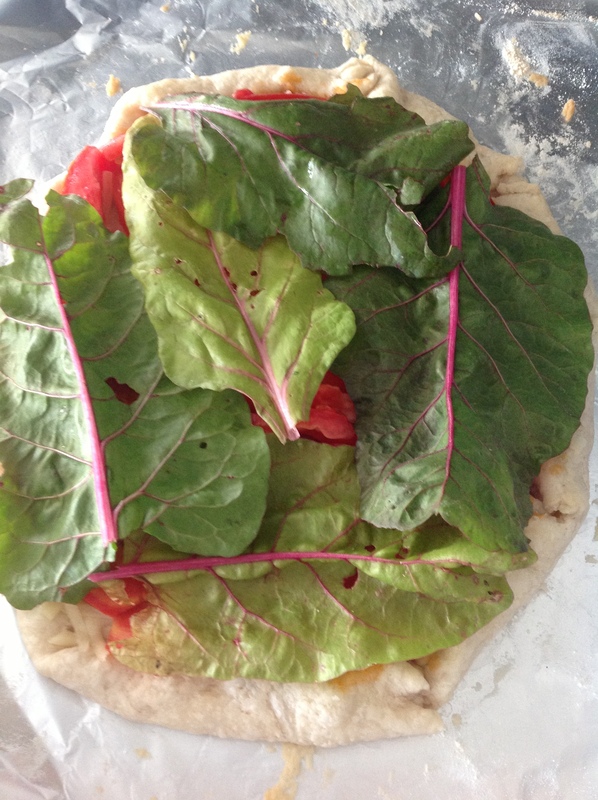 Layer greens on top of the tomatoes, if you’re using greens. 4. 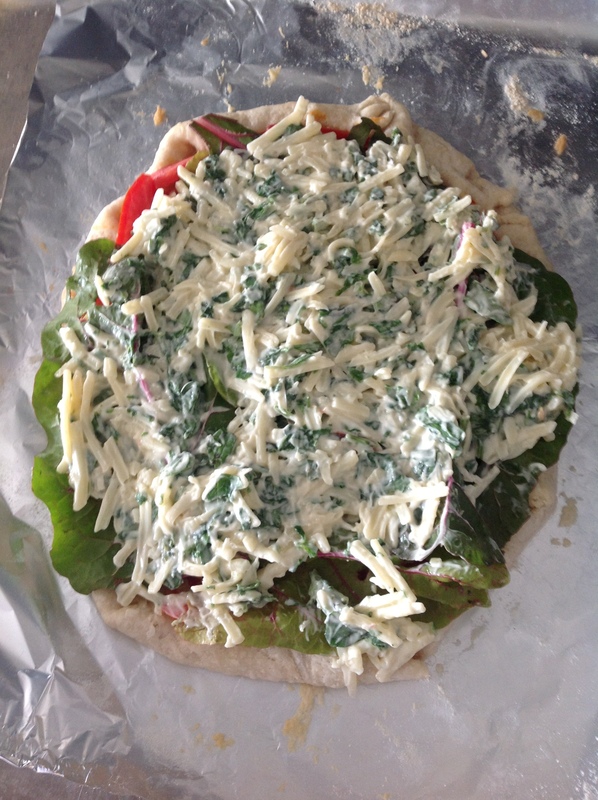 Mix together the basil, cheese, garlic and mayo. Spread the mixture on top of the greens (or the tomatoes, if no greens). 5. 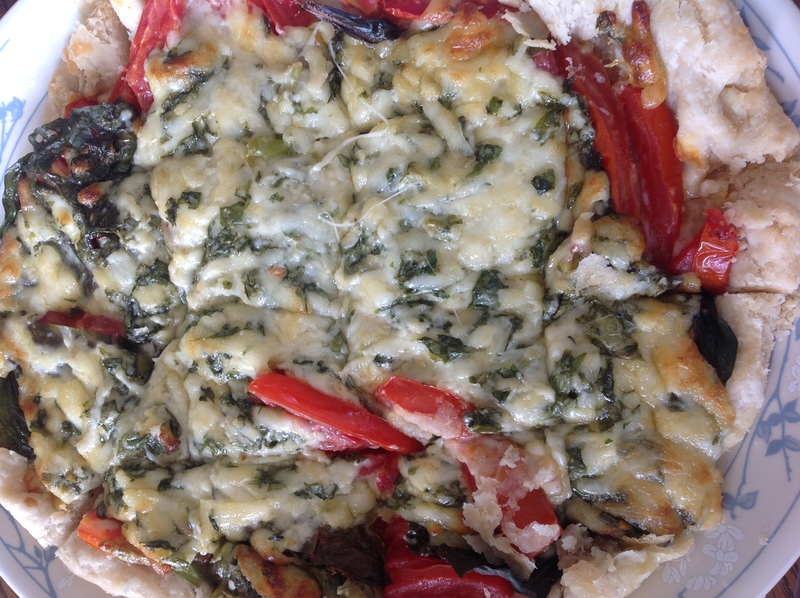 Bake for 20 to 25 minutes, or until the cheese is nice and golden. Let the tomato tart sit for about 5 minutes before diving in. Help! What the heck is this? 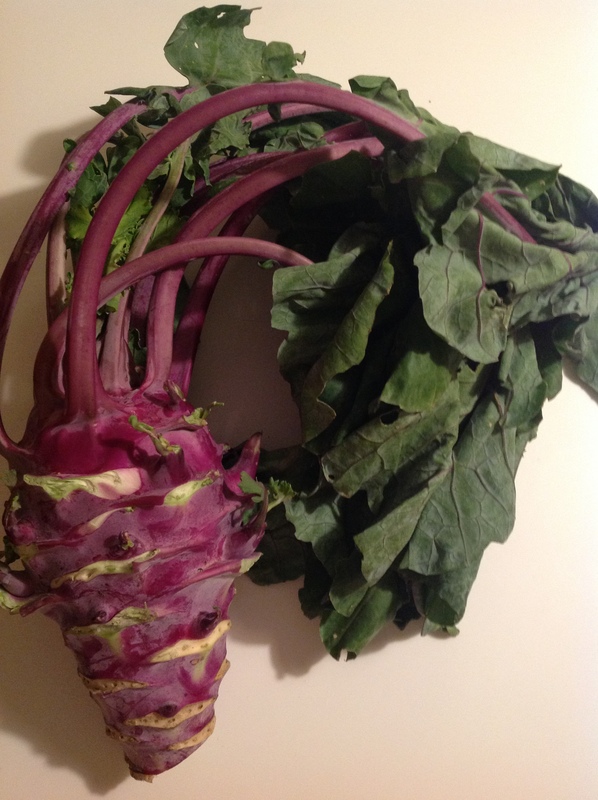 It resembles kohlrabi, except it’s purple instead of green. Also, it’s not smooth or ball-shaped. Hmm. Scotch Hill Farm’s internet is down, so we didn’t receive an e-mail detailing last Friday’s CSA share. And this guy isn’t featured in the weekly photo the farm posts to its Facebook page. I decided to tackle our okra first thing this week — I wasn’t sure how long it would keep and was dang curious about what it tasted like. It seems like most recipes that call for okra are for soups and stews, which I didn’t feel would allow us to really experience its full flavor. Ditto with frying it. (Plus I don’t really fry stuff.) But this recipe for Roasted Okra seemed to fit the bill and was simple to boot — even simpler when I used my Trader Joe’s olive oil spray instead of drizzling olive oil over the okra pieces. 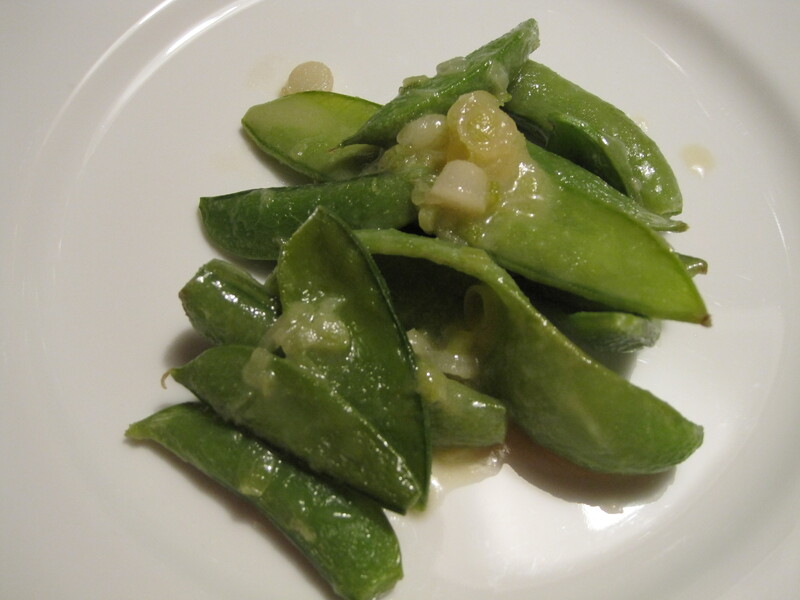 An abundance of snow peas has us agreeing wholeheartedly with the old adage that you can have too much of a good thing. 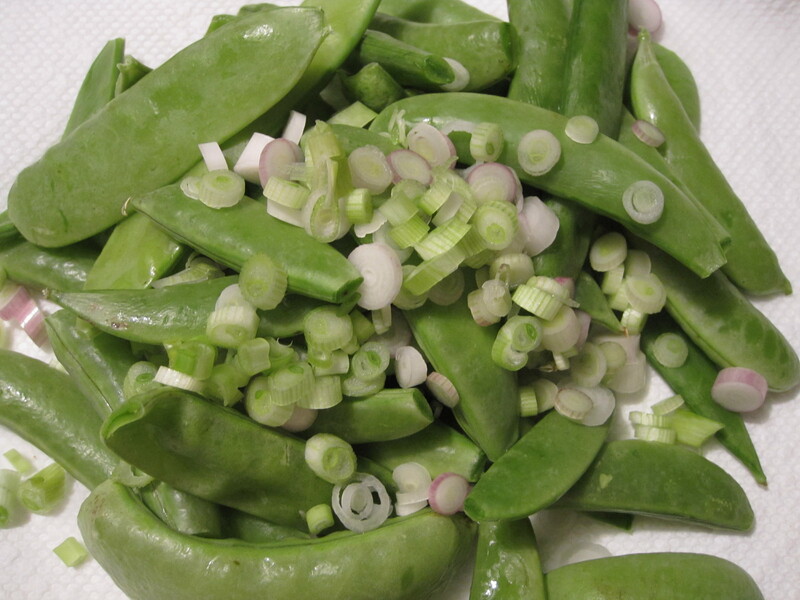 I’d repeat this recipe, but I unloaded our last bag of snow peas on a neighbor before heading out of town for the weekend.